Please tell me to never feel guilty for starting again. I can’t wrap my head around the fact that I have wronged the family for being pregnant again. It came to us as a surprise, I felt scared and wary at same time. Giving birth to four amazing humans seemed I have cheated death that many times. Now, I'll be dealing with all the pregnancy hullabaloos all over again. It's so ironic feeling alone (but we are actually two lives living in one body, duh! ), and how it felt so unfair. "Can I hear Amen among the crowd?" But where and how to start? You see, I've won my life back after confining myself under my kids own lives, with opportunities and abounding blessing beyond my understanding, and I was happy, I felt alive, like my brain cells were on full gear and life never felt so vibrant. My kids have grown up, my husband and I went on unceasing dates and romantic getaways, and yes, we were sleeping to our hearts' content, and with God's grace, we're doing quite well with finances. If you have been a follower of this blog, you know how I made motherhood as my proffession and I took it seriously, I was trying to ACE it, as if I'm going to get a citation or honorary distinction. However, along the way, I lost myself, and there were that lowest moments in my life when I thought I wasted my life away, because I chose to be a good mom and wife and I never felt so TIRED and WEAK, that getting my head above the water was a tough challenge. But thank God I managed to be resilient. Not because I am a mother but I need to be me again. I cried myself to sleep, prayed to God for a blessing of courage, a blessing of acceptance, a blessing of love, a blessing of resilience. At 21 weeks of pregnancy, I still haven't gotten a clear plan, I'm still exhausting myself trying to figure out what I'm going to do next, while convincing my husband that we are going to make it through cause God will always take care of everything as what He had been doing. But, I haven't convinced myself yet of that. Judge me by all means, spare me spite for being faithless. Because, I can not be a hypocrite while feeling so hurt. While everyone was wishing me well, and taking the news so gladly, I'm sure some at the back of their minds are saying "oh you're old to still have a child" or "how are you going to raise a 5th child, while I was hitting it hard with just one!" And me saying, "do you want to switch situation with me?" I know, know, each of us has our own world to carry, but when you are pregnant, that changes the whole perspective. I'm sorry, but I can't help that such negative thoughts get in my way. So, I ask you, the next time you see a post about my pregnancy please be so honest in your feelings, I don't judge, I can take whatever words are thrown at me, and I have a God who will always remind me how He shields me and cover me with His love, and I guess that's how I'm going to deal with myself and my baby. Well, all is accepted just like any other #Realmoms, because after all, there is no perfect moms, just #Realmoms. 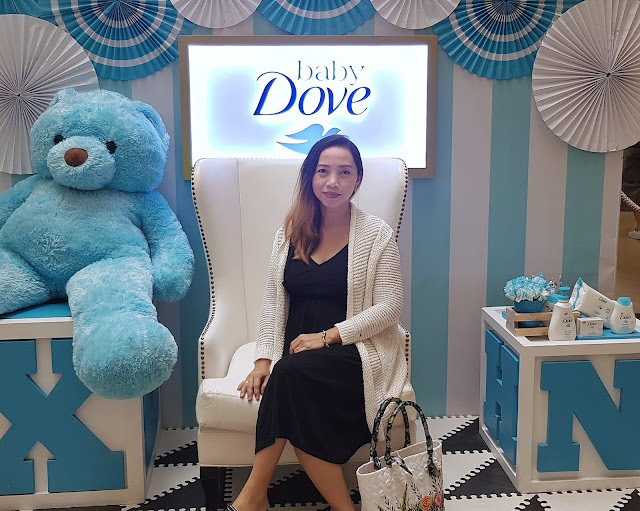 That's a groundbreaking realization for me after having to attend #DoveBabyPH's and #MommyMundo's #PregnantPause talk yesterday at The Poduim mall. 1. Moms should trust their own ways because there are no perfect moms, just real ones. Whether you're a first time parent (which most of the attendees are, pregnant couples) or like me who just needs to re-learn the ropes of pregnancy and post-partum motherhood, you know best, your body and how your baby will react to whatever environment itwill grow to. We know moms only want what's best for their babies. 2. For pregnant moms and dads alike, here is a question from Rome Kanapi? "Do you know the signs if you are already giving birth?" baby insi de the womb. The color of the liquid tells vital signs regarding the situation of the baby and can tell whether it's time or there is something wrong. Normally, it is clear (a little hazy at times) so it is easily compared to urine. sometimes, there would be traces of light brown but it may only signal blood, which is also normal. Act quickly when the water has traces of dark green to black coloration, as the baby might have pooped already, this condition is called passing of meconium as this may be dangerous to the baby. O - Amniotic fluid has no odor, however if there are some unlikely odors, make sure the doctors are notified about it as it may signal an infection. A - Amount of Fluid is also crucial, as during pregnancy, vaginal discharges is normal, but when you see a pool of water coming from you, be cautious, it may mean the bag had raptured already and it's time to go the hospital. T - Time of Rapture. Take note when the water bag breaks. When the water bag raptures you have 12 to 24 hours for childbirth. It does not necessarily mean that the baby will come immediately when it does. Now that you are aware about sacs rapturing, don't be scared, in fact, you should be mindlful. Get your hospital bags ready, but the best advise a friend could give is, after noticing the amniotic fluid, you may still take a good bath (shower) as this may be your last, not until after at least a month of giving birth. Al least, you still feel clean and fresh before going to the hospital. 4. When it is time to go to the hospital, go directly to the delivery room. Make sure you know where it is in the hospital you have decided to give birth at. Don't go to the Emergency Room any more as this may incure same procedures to be done in the delivery room, and can also add up to your billing. Timing is everything when it comes to contractions, so better know how to track your contractions correctly. In my first brithing experience, we ended up being in the hospital two days before our son arrived. That they have to induce my labor and break open my water bag as I have dilated maximum already. If you don't time them correctly, you may end up spending extra time in the hospital (and spending more) before your birth, rather than relaxing at home. When you feel that the pain is too much and there is tightening in the whole tummy (and relaxing of the uterine muscle). You will need a watch or a stopwatch to track your contractions. To do so, time the contraction fro start to end, of every contraction. Check the duration of the contraction, is it 10 seconds long, 20, 30 seconds before it relaxes again? The relax stage is the interval of the contractions. Because it is periodic, but may be intermittent. And the pain varies from one person to another. But normally, the increase in pain is from manageable to really extreme when it's timeto push the baby out. According to Rome, best to go to the hospital when the contraction last about to 45 seconds to 1 minute and with 7 minutes interval. For moms, this is one of the hated part of pregnancy but try to think about it positively Think of each contraction as bringing you that much closer to the birth of your baby. Visualize what the contractions are accomplishing, the thinning and opening of the cervix and the pushing of the baby downward. Try to work with your body rather than against it by staying as relaxed as possible during the contractions. You can now say THIS IS IT, FINALLY! But can you handle the pain? 6. Pain Management during pregnancy and labor. Pain during pregnancy is different from one individual to another. While women are experiencing nausea and other signs from the onset of pregnancy, I was traveling from one province to another and even had a wintry Christmas in Korea. Same goes probably with the whole period of pregnancy and up to labor. Rome taught us to be calm and relaxed with some techniques to lessen some the pains. As the tummy gets bigger, you tend to move heavier and slow, let's not talk about high-risk pregnancy as they only need to be in bed most of the time (but this too can be taxing on the back and pelvic areas. a. We actually began with the I AM RELAXED breathing procedure. It's a total chage of mindset thing. While eyes closed, hum or silently speak "I am" when breathing in slowly and "relaxed" when breathing out. Continue doing so for least 10 times or more. Inhale deeply into your belly, through the nose (if you can't, use your mouth), bringing the air deeply into the lower lobes of your lungs. As you do this your abdomen will rise. On your out breath, your abdomen will sink back into your spine. Be aware of your ribs. Experience your rib cage expanding and contracting with each deep breath. Inhale to the count of five, and then hold for a moment and then exhale to the count of five. Massage is a natural pain relief that relieves tension and anxiety and over all promotes support from the partner or dad. One massage technique your partner can do at the lower back is by using his hands, go slowly making number 8, either alternately with two hands or just one hand. Or just by stroking slowly the whole lower back. Also, another trick is when there is contraction, use your thumb to press on sacrum (a triangular-shaped bone at the bottom of the spine), do this during the whole duration of the contraction, you can also use the bottom of your wrist if your thumbs get tired. d. Another way to relieve yourself from pregnancy pains is with relaxing exercises. You can twist around your tummy slowly standing up. You can also try squating slowly to ease down the groin area. e. Do the Kegel exercise. Once you know how to isolate and control your pelvic floor muscles, try practicing long, slow contractions: Increase the contraction strength for a count of five seconds, hold for another five, then relax slowly for a count of five. Think of the pelvic floor as an elevator that is moving up a floor for each count of five, and going down as you relax for a count of five. Work up to 10 or 15 long, slow contractions twice a day. Lastly. the best way is to ask God to help you with the whole pregnancy and birthing process. Make your prayer specific, about removing all the anxiety and the drama that goes along with it. Ask in prayer what you don't want to feel, say the pain, the hardships, fears and even your future and the baby's. Pray with your partner and help each other, comfort each other and assure that everything will be fine. Visualise that everything will go smoothly and soon you will be making memories with your little one, together with the whole family. That said, I ask everyone, to be more mindful and insightful in giving comments, try emphatizing to your pregnant or mommy friends and relatives. Because like babies, like any other, we, mothers also belong to this world. Do pray for us to be strenghtened duting this hard and painful times. Also, let us be seen as who we are, not by how the world wants us to be. Let us be heard because we need to. Let us stop being judgemental, to a mother who does not want to have another baby or to someone who wants more babies. All we need are caring voices and hands to assure us that everything will be okay and that we have someone to rely on. Be someone who can advise how to make pregnancy and giving birth less of a burden and that Life has its way to heal itself and get you back on track in fulfilling your dreams and life goals. Like what DOVE, our family's favorite skin care line, said there is no perfect moms, only real ones! I believe that it is also safe to assume that the popularity and necessity of human hair extensions uk in the market will most certainly continue, and therefore be a part of our brazilian virgin hair for centuries to come. Human hair wigs are very popular as well as simple to maintain. Human hair wigs are delicately selected. Often unless the lace wigs uk is strong and durable enough it will be rejected for donation or sale for the cause of wig making. There are, however, other options to human hair wigs uk if you are looking for the most realistic and flattering wig possible. It is great to see human hair wigs that are incredibly durable. Many people who sell their lace wigs uk making have strong and beautiful hair, therefore, this particular kind of hair wig is more likely to last and last. We can easily gather through documented historical fact that wigs have maintained their popularity.